So you’ve already looked up posada in google translate and it came up as inn. Bingo! Posadas, held during the nine days before Christmas, recall the journey of Mary and Joseph from Nazareth to Bethlehem where they seek a place to stay to await the birth of Jesus. The 9 days honor the 9 months of Mary’s pregnancy. Pre-Columbian Mexico celebrated the arrival of Huitzilopochtli (god of war) during the winter or Panquetzaliztli, from December 17 to 26, which coincided with the time when Europeans celebrate Christmas. Close enough for folks to switch. Posadas are held by all the churches and most neighborhoods but the big ones are on Christmas Eve. 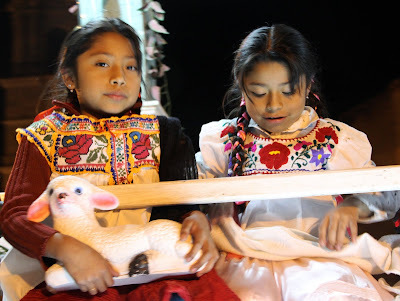 A posada starts with a procession featuring Mary and Joseph, in Oaxaca played by children, and a group of faithful followers usually with candles. 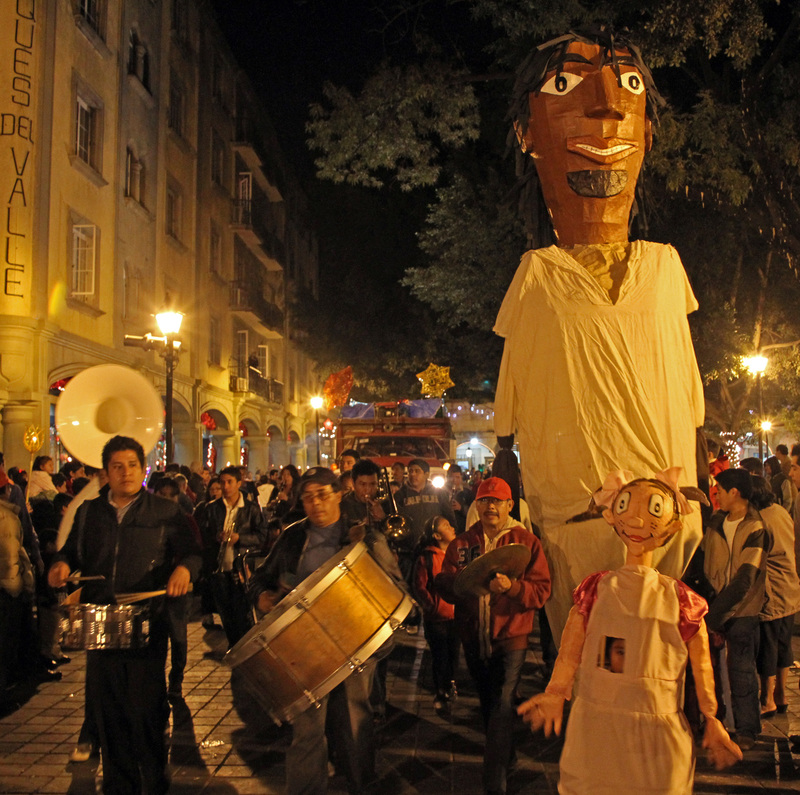 But let’s not get too solemn, the procession includes bands, fireworks, and large paper mache figures. These days Mary and Joseph get to ride on a float (usually a decorated flatbed truck) and angels, shepherds, and wise men come along for the ride. Hey, you wouldn’t want your kid left out either. The posada procession goes from house to house (that’s after a few laps of the zócalo to show off) singing for a place to stay, getting turned down, until at last doors open and they’ve found the party. It is customary to pray the Rosary because the celebration is for the love of Mary and to celebrate that she is about to give birth to Jesus. During the posada children break the piñata. This activity is filled with symbols and analogies. The piñata must have 7 points representing the 7 deadly sins but it must be full of candy representing the grace of God. The act of breaking the piñata can be interpreted more or less as follows: Each of us with blind faith (blindfolded) in support of God (the club) are fighting sin (trying to hit the piñata). We help our brothers and we indicate the way forward (people screaming) and when we will eventually overcome sin (break the piñata) God's grace (the candy) spills over us. The posada ends with a fellowship in which the guests drink and dine, usually a big planned potluck. Another important custom in Mexico is for families to own an image of the Christ child, a niño Dios. A godparent is chosen for the niño Dios, who is then responsible for hosting various celebrations between Christmas and El Día de la Candelaria, Candlemas. On Christmas eve the niño Dios is placed in the Nativity scene, on January 6th, King's Day, the child is brought presents from the Magi, along with presents for the children. A key tradition of King’s Day is the Rosca de Reyes which is a sweet bread baked in the form of a crown. It's filled with nuts, figs and cherries and decorated with pieces of orange and lime and is served with hot chocolate. There is a small doll baked inside the bread to remember how Jesus had to be hidden from King Herod and his army. The person who finds the doll is responsible for hosting Candlemas Day on February 2nd. El Día de la Candelaria, like many other Mexican celebrations, represents a fusion of pre-Hispanic traditions and Catholic beliefs. Celebrated on February 2nd, it falls forty days after Christmas, and is celebrated by Catholics as the "Feast of Purification" or as the "Presentation of Christ at the Temple." According to Jewish law it was customary to bring a baby to the temple after that period of time had passed. February also 2nd marks the mid-way point between the winter solstice and spring equinox. This may be a vestige of an old Pagan Tradition, since Feb. 2 has long been thought to be a marker or predictor of the weather to come. Remember that in the US Feb. 2 is celebrated as Groundhog Day, but back to Mexico. El Día de la Candelaria is a follow-up to the festivities of King's Day and Tamales are the food of choice. But this post is about posadas and the pictures are of the processions. I hope you take time to check out the photos.